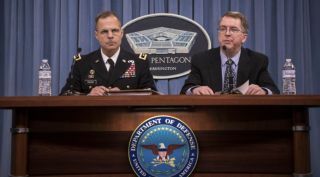 David L. Norquist, right, the Defense Department's comptroller, and Army Lt. Gen. Anthony Ierardi, the Join Staff's director of force structure, resources and assessment, brief reporters on the fiscal year 2019 defense budget Feb. 12, 2018. WASHINGTON — The Trump administration's budget request for the Defense Department includes $9.3 billion for space programs — $4.8 billion for satellites, $2.4 billion for launch vehicles and $2.1 billion for maintenance and support. The funds also cover space tests and classified programs. Officials said this budget marks a "pivot" in military space programs from systems that were built for an era when the United States was unchallenged in outer space to a future when adversaries like China and Russia could threaten U.S. access and freedom to operate in space. The 2019 space budget is 1.5 percent larger than the $7.8 billion request for fiscal year 2018. Overall, the president is proposing a $686 billion budget for the Defense Department, of which $236.7 billion is for research, development and procurement of weapon systems. Pentagon comptroller David Norquist said Trump's budget request, about 10 percent larger than last year's, "begins a recovery from over $400 billion of lost capability" following years of funding ups and downs. Pletcher said the Air Force's space budget is up by 8 percent, even though the service is cutting procurement of space systems by more than a billion dollars. The Air Force's $2.5 billion space procurement request is down from $3.4 billion a year ago. The growth is in research, development and operations. The Air Force increased R&D for a new missile-warning constellation from $71 million to $643 million, and added $452 million for the development of a new GPS satellite. In the operations and maintenance account, it included $8.5 billion for space forces — up from $7.2 billion in 2018. Most of the U.S. space portfolio is managed by the Air Force, whose overall budget would increase by 6.6 percent in 2019. The top line funding for the Air Force is $194 billion but the service only controls $156 billion. The rest is "passed through" to medical agencies, to the U.S. Special Operations Command and to the intelligence community. Presumably some of that funding is for the National Reconnaissance Office's spy satellite portfolio. Norquist said the 2019 budget "addresses growing threats, complicating an adversary's ability to counter U.S. space superiority, while enhancing the department's ability to identify, characterize and attribute all threatening actions in space." The space budget shifts procurement dollars to research, development and operations. The pivot is most noticeable in the Space Based Infrared System (SBIRS) program, the constellation that monitors missile launches around the world. The R&D funding "accelerates development of next-generation overhead persistent infrared satellites" and funds ground segment development, according to Air Force budget documents. The decision to stop buying traditional SBIRS satellites "transitions our space investment by accelerating efforts to move to a defendable space posture," the documents said. "This budget discontinues the procurement of SBIRS 7 and 8 and shifts funding to engineering and manufacturing development of evolved SBIRS. The so-called E-SBIRS will keep space systems "responsive to new and changing threats and the next gen OPIR will detect and report on current, emerging and anticipated threats." A big winner in the 2019 budget is the Evolved Expendable Launch Vehicle (EELV) program that provides launch services for military and government satellites. The Pentagon is seeking nearly $2 billion for five launches, including $245.4 million for research and development towards a new rocket engine, and $1.7 billion for the procurement of five vehicles. In fiscal year 2018, the budget was $1.5 billion for three launches. The Air Force also is shifting gears in the Global Positioning System program that provides position, navigation, and precise timing information for military and civilian users. The plan is to start a new program to succeed the GPS 3 constellation that is currently in production by Lockheed Martin Corp. The Air Force intends to select a new design and seek new competitors. The budget includes a big increase for the future GPS 3 research and development — from $1 billion to $1.4 billion, and cuts procurement from $101 million to $85 million. The Air Force is increasing R&D funding for protected satellite communications. The Advanced Extremely High Frequency (AEHF) classified constellation is getting a boost from $315 to $677 million, whereas procurement goes down from $138 million to $91 million. The AEHF is a four-satellite constellation in geosynchronous orbit, and two more are in production. The budget funds the 10th and last Wideband Global SATCOM communications satellite vehicle projected to launch in November 2018. The fiscal year 2019 request includes $49.5 million to complete the Air Force Commercial Satellite Communications Pathfinder projects, which are exploring ways to reduce cost and improve the resilience of commercial satellite communications. Air Force Undersecretary Matt Donovan told SpaceNews on Monday at an Air Force Association event that the 2019 budget was all about making sure the U.S. can defend its space capabilities from potential attacks by rival powers. "We have to make sure that anything we launch into space is capable of being defended," Donovan said. "If they cannot be defended, we put those capabilities at risk." In this budget, he said, "We're shifting focus to makes sure systems can be defended." One way to make constellations less vulnerable is to deploy smaller, less complex satellites that can be replace more easily, Donovan said. "If you take one giant satellite and put every capability in the world you can think of on it, it takes many years to develop and requires a huge launch vehicle," he said. "That becomes a vulnerability." Space-based technologies are also being funded in the 2019 budget by the U.S. Missile Defense Agency. Per congressional direction, the MDA is seeking $16.5 million for a "space based kill assessment" experiment. It will use a network of infrared sensors to create a ballistic-missile defense capability. The full SKA network would be on orbit by fiscal year 2018. MDA also is requesting $37 million for Space Tracking and Surveillance System satellite operations and sustainment. These low-Earth orbit satellites were launched in 2007 and have far exceeded their life expectancy.